Find a sailboat that will be safe to single-hand on a world circumnavigation and provides a comfortable home for a live aboard sailor and his two dogs. I narrowed the selection down and continued to look. I finally settled on a sailboat. It was a compromise - any of the boats I looked at could have met most of the requirements. SV Music has brightwork!!! And lots of it. The brightwork is my replacement for mowing a lawn. Each year I have to spend many days sanding and refinishing all of the teak trim on the boat. The first two years were tough. Now that finish is in good shape, the maintenance is quite a bit easier. Some of the systems were older and not as well maintained as I would have liked. The cold plates were original and so was the Webasto heater. To top it off the diesel tanks were a botanical garden and the wonderful flora made its way into the fuel lines and injectors. My initial outlay to get the boat up and running was about 15K. That included the repairs to the fuel system, repairs to the engine, replacement of the radiator hoses (yes auto store radiator hoses used below the water line) and rebuilding the galley stove. This was less that I had planned based upon everything I had heard and read. So there was some advantage to shopping for a boat that had system in good working order. 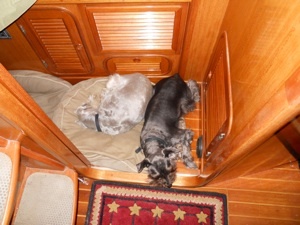 In March 2008, Cinco, Jupiter and I moved aboard SV Music. It is now our home and we love it. Best sleep you will ever have is in a rocking berth. In the first year, Jupiter (aka the Purser) decided that the most important thing to replace was the Suzuki outboard. We had the motor services twice but the old 1992 motor was abused too much in its past life and Jupiter thinks that going to shore twice a day is the most important thing. So we replace the motor with a Tohatsu 6 hp 4-stroke. Jupiter has been very happy with the results. The motor starts every time and doesn’t die in the middle of an important run to the shore. The other major change in the first year was the replacement of the the Glacier Bay refrigeration and cold plates. The compressor was on its last legs when I bought the boat and it died in July. As a live aboard, a good refrigerator and freezer are essential. Jupiter agreed and we replaced the system with a SeaFrost (air cooled) system. I was torn about the different systems, but decided to use the air cooled system so I could run the system when the boat is on the hard and I could eliminate a water pump. The other choice was keel cooled, but we decided not to go that route since it would require another hole in the boat and the waters in the bay get above 90F in the summer. The system is a freezer with spill over refrigeration. It has worked like a charm after the small leak in the coolant line was stopped. It has an option to add water cooling if needed. Things are different when you are in a boat on the water surrounded by ice and snow. The old Webasto proved to be useful, but it also demonstrate a flaw in its design. The system requires maintenance by an authorized dealer every 800 hours or so. It will break on Friday afternoon and the authorized dealer is not in until Monday and the parts have to be shipped from Germany and Customs will hold them up for a few days. Do that every 800 hours or so and add the cost of the service (in Annapolis this is not cheap) and you are looking at 2K a year in maintenance costs. Well replacing that was a “no brainer.” We replaced the Webasto with a ITR Hurricane® and haven’t looked back. Now we have “central heat” using two zones and we get hot water if needed when we are far away from AC power and not running the engine. The installation was simple, but running the hot water lines was a bit of a pain. I reused the old air vents and added a couple of additional vents. The ITR maintenance involves a screwdriver and a vacuum cleaner every 1000 hours, but since it only runs about 1/2 the time of the Webasto, that more than doubles the service interval. The ITR Hurricane consumes more diesel than the Webasto but the boat is very comfortable in the winter. We still have room to expand the system if needed. Jupiter wouldn’t approve the expense until I promised to install a vent right over his bed. You can see the black vent on the baseboard in the pictures. The dogs spend the winter snoozing next to their own heat vent. Spoiled? Nah, just smart. Hauled out and serviced the bottom and repacked the rudder. Installed Jack lines early in the third year as well as black netting on the lifelines. The dogs have their own tethers and the netting I added gives me a great deal of comfort with the dogs. Jupiter likes to swim and has no problem jumping overboard for a cool dip or a good duck chase. Added a car-puter in the nav station. Still trying to decide what navigation software I will load on it. I will have to pickup an IP67 flat panel display and VGA/DVI repeater so I can install a display in the cockpit as well. Built shelves into the back of settee bins. Removed the microwave. I have yet to construct the rolling teak doors to cover the new storage space the removal has created. Re-bedding continues: two hatches and all of the ManShip® ports. The boat is now very dry. No more seepage into the lockers and no more seepage around the ports. Still have more re-bedding to do. I imagine this will be like the bright work, a never ending project. Replaced boom sheaves on main sheet. I’ve become skilled in splicing double braid lines. Replaced old 55 watt tractor lights with new 10 watt LED spreader lights (WOW!). Installed a fuel polishing system. More to come on how it works. Emptied the storage shed. Now everything is on the boat. So much for guests staying the the V-berth. It’s going to take me some time to figure out where to store this stuff. I’m sure i can do it, the problem is being able to find it when you need it. Just finished the rolling teak doors for the gap where the microwave oven was. I’ll need to build a different set of u-channels to guide the door, but I’m really pleased with the doors. The new guide are working better, but the door is still a bit stiff sliding side to side. I should get easier as the parts all wear a little. Pulled the starter and had her rebuilt. Serviced the ITR heater. I had to clean the ITR spray valve with acetone this year. Replace the valves on the Bilge pump. Cleaned Dink’s motor. Put 3 coats of varnish on the all the wood work including the rub rail. Used epoxy for the dorade vents, then topped them with varnish. I hope that the epoxy will stop the blistering that occurs on the dovetail joints. Got my HAM General License (KB3YMP)! Modified the iCom M810 by removing a couple of resisters and opened it up to the HAM bands. Rebedded the front hatch, it had a small leak and I can’t have a leak in the boat. Next I’ll have to varnish the interior of the hatch to complete the job. Changing out the H2O pump from a Jabsco to a Whale. I hope the Whale last longer! Purchased some starboard to replace the slides on the companionway. The existing slides are cracking and breaking off. I also plan on using some to create a hood for the instruments that are mounted in the front of the cockpit combing. This should help keep the sun off of them and keep rain off when the front panel of the dodger is rolled up. Replaced the compressor on the ITR heater; after 3300 hours of operating the compressor decided to die. It was an easy replacement, but the parts cost twice what I expected. The heater is working great again. Installed stainless tubing between some of the stanchions so I can tie gear down on the rail. My concern is that the sheets will catch on the gear. I plan on testing it this sailing season. Purchased folding mast steps and have started the installation. It is slow drilling and threading. 1/2 installed... still making progress. Installed a new engine room blower. I had to abandon the old one in place cause there was no easy way to reach it. It is mounted under the freezer. Next time I pull apart the aft berth I’ll see if i can unmount and remove it. The bearings in the old blower were screaming after a couple of minutes of runtime. The new blower doesn’t scream. 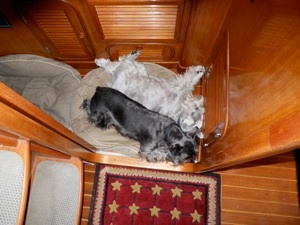 Re-bedded the galley hatch. That project turned out to be more than I expected. I had to remove the life raft bracket and found that it had been drilled through the core with no protection. Also removed the 4 pad eyes on the deck that were similarly drilled. So I repaired those with bigger holes and epoxy, then I re-bedded the hatch. Replaced the pressure water pump. The old one died. I have no idea how old it was. Rebedded the fix port windows on the starboard side of the boat. The port side windows will wait until October or next spring. Stripped the eyebrow down to raw wood. My repair and maintenance was not working on the eyebrow, likely too much damage from the PO. Putting 9 coats on it this year. Looks like I’ll have to strip the hand rails down to raw wood as well this year. The toe rail, rub rail, and cockpit are looking nice with regular 3 coat annual maintenance. Installed intake vent for refrig compressor properly. Recharged refrig gas. Moved spill over fan so that frig is a frig and not a freezer on the bottom shelf. Rebedded boat hook (Music has a custom teak boat hook and mounting bracket) and backfilled holes with epoxy. Stripped cockpit table and refinished. Stripping old glue of dink’s rub rail. Will have to glue it back on. Avon® dinghies are known for bad rub rail glue. Glued the rub rail back on dink. This didn’t work, so the dink will go without a rubrail until it dies. Serviced outboard carb and plug. Forespar® in-mast furler broke while sailing. The screws that connect the drum to the pole broke. I drilled a 1/4 inch hole through the assembly and installed a pin with key rings. Looks like that will hold. Also removed the boom light wire that was installed through the mast since it is not possible to service the furler while that is in place. I won’t put the wire back since I never use that small light. Ordered parts for the speed transducer and replaced the old one. Reconnected saltwater wash down pump to salt water instead of fresh. Now I can really hose down the anchor chain without worrying about using all the water in a fresh water tank. Works great, so now I have both fresh and salt water spigots on the deck. The Furuno Radar is mounted at the Nav station but there is no display in the cockpit. I’m trying to rectify that now. There is a pin-header on the circuit board and I have found the pinout specs for a VGA connection. Waiting on a connector to be shipped from and electronic shop. Once here, i’ll wire it up and test it. This will make the radar useful for a singlehanded sailor. Result, Furuno uses a non-standard video signal. Looks like a new radar will be on my list of things to get. Added the solar panels and replaced a lot of hoses on the boat. I will have to get my propane tanks inspected and new valves to upgrade to the new standards. Sewed hatch cover and planning a new radar and mount for a wind generator. An arch has been ruled out cause of the large radar pole I have and the sweeping back end of my boat. Installed a pre-filter for the water system to keep particles out of the lines. Also replace the Galley faucet. Took a few more fittings than originally estimated, but it is nice to have replaced the worn out faucet. Added relays and shutoff circuits to the charging circuit. These should protect the LiFePOs from over charging. New Main and Staysail made by Quantum. Looking good with the new (to me) Yankee from the previous owner. It is a never used Yankee… I’ll have to reset the whisker pole for the new cut. Got a stainless steel boom brake, have to rig it to the boom and get the leads down to the pad eyes by the rigging. Replace the running lights, I have Hella 50’s and they are expensive. Lucky that Bacon’s had a couple that I could buy for cheap and gut the insides out to reuse in my lights. I’m working to get quotes for a complete replacement of my standing rigging and saving up bucks for the sailboat show this fall. This fall I replaced the electronics on the boat with new SIMRAD MFD/Radar/AIS/WiFi etc. This took quite a bit of work, but the end result haver dealing with the older NMEA0183 and how to integrate that finally was resolve is awesome. I also replaced the computer in the navstation with a LIVA DC powered dual core Intel processor and touch screen. Wow, it is awesome. I also replace the iCom 810 with a Kenwood TS-480 HF Ham radio. I added a SingnaLink modem and an new HF Tuner and now I have nice connectivity with WinLink. Also this fall I go a D400 wind generator (I’ll mount it this spring when i pull the boat up on the hard). I also added a new iCom VHF with DSC and GPS radio as the main VHF radio. Added a new handheld radio that is also DSC and GPS enabled. All the upgrades are being forced to be completed sooner than normal because i registered for the A2B race this June! Ugh, but is is a forcing factor in getting the upgrades done so that I will be ready to retire and head out in the Fall. I just installed the EPIRB and will see a guy about a Viking liferaft on Saturday… likely I will not buy until the Baltimore boat show (gotta get a discount :) ). All of the upgrades have been completed prior to the A2B race in 2016. Since the race, there is one set of possible new upgrades - namely, replace the autopilot computer and compass with newer models so that she can talk with all the new gear. Auto did a great job on the A2B! But could not hold a course to wind cause the wind instrument had to be replace when he mast was pulled. Okay, I bit the bullet and purchase a new auto computer and compass the old ram and rudder sensor will work with the new gear. This should be the end of upgrades. Replaced the water pump with a Whale. It is working much better. It draws many more Amps, but runs for much less time. The plastic windows in the dodger shattered this year and the thread was getting a bit bare. So this early summers project was to sew up a new dodger. It turned out pretty nice for my first Major sewing project. The house battery bank died a couple of weeks ago. One of the cells in an 8D went bad. I've managed to pull that 8D out of the set. Now I have to start planning to replace the bank. I have been looking at LiFePO4 for the past several years. I was planning to replace the bank next year (it would be 10 yo). Looks like I'll be replacing it one year early. I'll post more about the LiFePO4's when I start installing them. I had the staysail re-sewn as I blew the clew out in 30kts winds the other day. It looks nice. Hausley in Annapolis did the repair. I also had the boot of the sail covered with Phifertex to stop the rope burn caused by the Jib. Finished adding Reflectix insulation to the cabin top. It has made a significant difference this winter. I look forward to seeing how it helps in the summer. Adding a Inmarsat phone, just ordered it… see what happens when it get’s in. Phone is in. I may have to add an external antenna. We will see. I have a call into Quantum about the Code-0 I plan on adding. Also have most of the measurement for the replacement of the standing rigging. I have to make a few more second measurement to be comfortable. I’ve registered for the A2B race and have a full crew of capable sailers. I have a crew for the return but looking for one more to join me on the return trip. 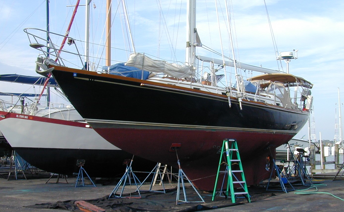 This week (Feb) I have to contact the marinas to see which will let me haul out, sand the bottom and pull the mast. All the new gear is working fine. I’ve ordered a Viking liferaft. I’ll have to have some Stainless made so that I can mount the new raft on the old Avon mount points. Update: I had the mast pulled and all new Hayn rigging installed. I also added preventers and the code-0 was delivered today (5/13). This weekend we will test it out. Finished the A2B race and everything worked out. Broke the toilet seat, broke a bolt on the radar arch and broke the ring that connects the halyard to the head sail bout 5 miles from he bay on the return trip. So far, all have been replace with the exception of the radar pole. Kato is checking it out and will give me a design to fix it. I hope to get that in the next week or so. Got the water make working. Oh if you have Zbrain then you need a special membrane… ugh and FedEx morning delivery won’t deliver to a marina! Ugh! so did the A2B without a water maker. Plan an pulling and soda blasting the hull down to the gel coat so i can paint her with a new hard paint before the departure in November 2016. No more upgrades, now we are in maintenance mode and sailing the oceans. I hoping it will be a while before I have to update this page. I’m sure there will be more upgrades, but not planning on any in the near term.